Ten findings from the BBC research on why Indians share fake news. The rising sense of nationalism is a major driving force for the spread of fake news, finds a BBC research study – Duty, Identity, Credibility: ‘Fake News’ and the ordinary citizen in India. The research adopted qualitative techniques of in-depth interviews and up-close observation of sharing behaviours citing the reason that the phenomenon of fake news is not well understood. The study was completed in three months. 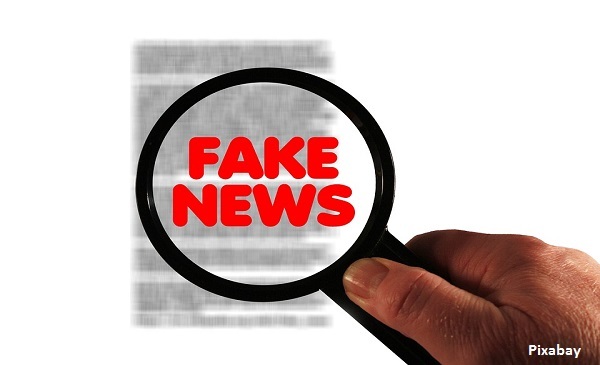 The coverage of ‘fake news’ by Indian media saw a 200% rise between January 2015 to September 2018 with around 47,543 news articles published during this period. With blurring lines between news media and social media, what people consider as ‘news’ is highly emotion driven and the source of the message matters less. What is important to the reader is considered as ‘news’ by them. Thus, the mechanism of digital sharing platforms work on ‘feelings’ rather than ‘thinking’. Loss of trust in media and the high frequency of information in the digital era have resulted in lower scrutiny of information. Fake news is not considered as a major social problem and people in general are not concerned about it. The exchanges and discussions on social media and messaging apps are of not rational or critical nature but validation of one’s own belief systems. Format of information that people consume or engage with more are images / memes with minimum text over text heavy messages or articles. ‘Screenshotting’ has become a common and instinctive practice. This preference for visual information has resulted in people reading only headlines and less interested in in-depth analyses. Sharing of information and messages on WhatsApp is more about validating one’s belief systems and identities. People consciously decide what to share in which WhatsApp group such as family, friend, work, political groups. While WhatsApp is a platform for like-minded / homophilic groups, Facebook is seen as a broadcasting platform. Users are more likely to come across opposing views on Facebook. But given the possibility of users just skipping opposing content, Facebook also tend to become an eco chamber like WhatsApp. 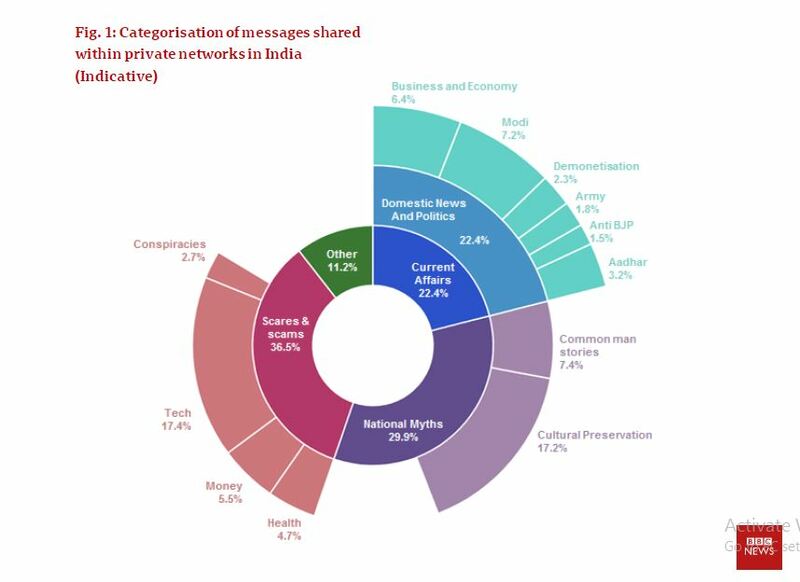 Of the messages shared on private networks, 7.2% are about Prime Minister Modi. The study analysed around 1000 WhatsApp forwards. Below is screenshot from the study. The motivations behind sharing of fake news are of two major reasons: a civic duty out of good intentions and a sense of nation building. The identities of the right, unified by Hindutva and ‘being Hindu’, are more crystallized than the left. The left identities are more diverse with no unifying narrative with occasional convergence on their opposition against the right and Modi. The volume of fake news messages from and supporting the right leaning identity are higher compared to the left. The narrative covers anti-minority discourse, Hindu superiority, revival of the Hindu and ancient Hindu glories, national pride as Indians and personality and achievements of Prime Minister Modi. Twitter network analysis of around 16,000 profiles and 370,000 relationships were conducted. The analysis showed higher proximity of BJP’s and Narendra Modi’s Twitter handles with pro-BJP amplifiers than Congress/ Rahul Gandhi with anti-BJP amplifiers. These 16,000 profiles were generated from a seed list of profiles (pro-BJP and anti-BJP) who are ‘sources of identified fake news’ and popular handles followed by these profiles. Twitter amplifiers are those profiles that have a wide audience and generate large number of tweets. In general production and dissemination of fake news by the right are more organized. The fake news ecosystem of the right is strong and densely inter-connected enabling smooth and effective circulation.